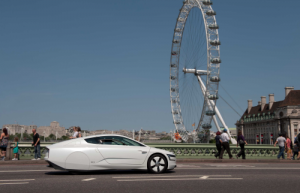 Volkswagen’s XL1 two-seat diesel-electric hybrid car has made its UK debut. The body of the 313 mpg, limited production vehicle is made largely of carbon fibre reinforced plastic (CFRP). According to Volkswagen, to achieve the target fuel consumption figure the XL1 was “aerodynamically optimised”, adopting the classic ‘tear drop’ shape and wing mirrors were replaced with small cameras (called ‘e-Mirrors’) which transmit exterior images to interior displays. The XL1 is manufactured at Volkswagen’s Osnabrück factory in Germany, which also produces the Golf Cabriolet and Porsche Boxster. Unlike these cars, the XL1 is ‘hand-crafted’ using small series production processes. Volkswagen confirms an initial production run of 250 XL1 vehicles. Pricing and sales channels are yet to be confirmed.